McDonogh’s Gable Braun (left) tries to get past St. Paul’s Frank Hapney after a faceoff win in Friday’s MIAA A Conference lacrosse opener. The No. 8 Crusaders built an early lead before pulling away in the fourth quarter to knock off the third-ranked Eagles, 12-9, in Owings Mills. With a year of familiarity under a new voice and several new faces, St. Paul’s School lacrosse believes 2019 will be a season of improvement. If Friday’s an indication, the Crusaders are ahead of schedule. The 8th-ranked Crusaders defeated No. 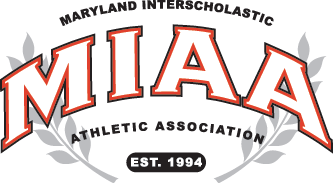 3 McDonogh School, 12-9, in the MIAA A Conference opener for both at John McDonogh Stadium in Owings Mills. Senior attack Andrew Milani and junior Logan Santos each netted four goals for the Crusaders (4-1 overall), and Seth Higgins tallied twice. Junior midfielder Dane Swanson finished with three goals and an assist for McDonogh (6-1, 0-1 overall). The Brooklandville school never trailed Friday, withstanding a McDonogh charge to send some shockwaves on the opening day of play in the nation’s toughest league. The Crusaders lost their final four league decisions last spring. The Crusaders constructed a 7-2 advantage before McDonogh pulled even late in the third. St. Paul’s remained composed, scoring four of the game’s final five goals to avenged an 11-6 loss last spring. Making the triumph even more sweeter was spoiling the Eagles’ debut as the nation’s top-ranked team, according to Inside Lacrosse. St. Paul’s didn’t break after McDonogh pulled even at 8 on longstick Jackson Bonitz’s second tally of the match, answering with a Higgins’ strike off a feed from Troy Barthelme with 18.5 seconds left in the third quarter. Junior Frank Hapney won the face-off to the start the fourth, resulting in Higgins’ unassisted strike. The Eagles kept the pressure, closing to 10-9, but St. Paul’s got a big goal from junior Connor Stein with 1 minute, 42 seconds left in regulation, and just three seconds left in extra-man. Junior goalie Jamie Grant followed with a huge stop and Santos’ empty-netter helped the Crusaders close out the victory. Grant, who finished with 12 saves, credited defensive mates Mason Woodward, Max Stukenberg, Will Burette and Chad Vasquenza for keeping McDonogh off the board the final eight minutes of regulation. The Crusaders were engaged from the opening face-off Friday, building a 4-1 advantage after the opening 12 minutes. After erasing a McDonogh extra-man opportunity, St. Paul’s bumped its lead to 7-2 with 5:44 left in the opening half after Santos secured a hat trick. Whitty wasn’t concerned with McDonogh’s national No. 1 ranking. He was impressed with his team’s work rate on both sides of the ball. McDonogh, which won collected four victories over nationally-ranked squad including with a victory over then-No. 2 Culver Academy from Indiana Monday, found itself on top of the IL national poll Wednesday. By early Friday evening, the Eagles found themselves 0-1 in the nation’s toughest conference for the first time since 2013. McDonogh looks to rebound at Loyola Blakefield Tuesday afternoon. St. Paul’s hosts St. Mary’s, hoping to start MIAA A play for the first time since 2010 when it last claimed the coveted the league trophy. Jamie Grant (left), Andrew Milani and Logan Santos came up big Friday for St. Paul’s lacrosse. The Crusaders host St. Mary’s Tuesday in Brooklandville.